The wording of the link has also changed. 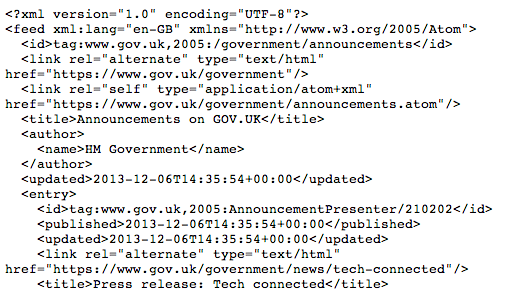 The “feed” link was originally called “Atom” after the format we use for our feeds. We ran user testing on these pages and discovered that nobody understood what “Atom” meant, so we renamed it to “RSS” after the more familiar (albeit technically inferior) feed format. Ideally, we wanted to call it “feed”, but we did not want people who did not understand what a syndication feed was to click on it and be sent to a page full of code. Adding the box has solved this problem so we can safely call it “feed”. Shouldn't we be tagging the URLs in the feed to see how many people are entering through feed readers? We can segment traffic from other people's feeds (when tagged) but not our own. We can also see what type of content gets feed reader users clicking. This change wouldn't test well with me - instead of being able to click the feed and have a browser extension handle the easy import into a feedreader I now need to fold in a manual step or two. Feeds are inevitably more complex and that's acknowledged by presupposing someone has a feed reader. I couldn't infer from your research whether given that context (of being a feed reader user) your subjects were fazed by the page of code?